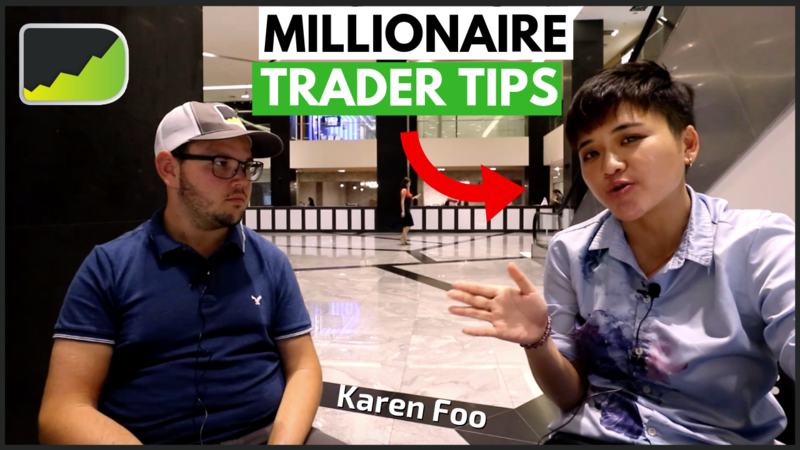 In episode 186 of the Desire To Trade Podcast, I interview Karen Foo, a Forex trader, motivational speaker, and author. After ranking #1 in a Singapore nationwide Forex trading competition, she came on the podcast to share the lessons she learned prior to becoming a profitable Forex Trader. - Like you can have a 99% win rate and still lose money in the long run. - Welcome back everyone, I'm sitting down today with Karen Foo in Singapore. What's up, Karen? - Sup, Etienne, good to see you again. - It's been a year, we've been here and I just like the fact that it feels like it's been a couple of days, like that seems funny. - Yeah, it seems like last year, it seems like so Etienne, time flies. - Amazing, so I wanna talk today, I wanna ask you some tips and things that you can show people. Last year we did the two things, or like two years and we do it together. Last year we showed some lessons. This is going to be different a little bit. So, I wanna ask you for your best three tips. You don't have to go too far, you could share a lot. I know you have a lot of tips, a lot of lessons, a lot of advice. But let's go like three things that you've learned over the past few years of trading for Forex that you think would help viewers get better. - Three tips, so everything comes down to three tips, okay let me try. The first tip is you know, if you're a big enough trader one very important thing is don't freaking rush it, just don't rush it. Like way too many beginners, they just come into trading, they be like oh I can trade 1000 to 5000 within one week. - Then it's like, it gives you this false illusion that you can get rich quick. And this is a mistake that I made when I first start out. 'Cause I turn a 1k account to a 2k account in one day. Then I'm like whoa, 100% returns in one year. You can do that for one day. But my question for you is, can you do that the next month, next year, two years later? Like you need to be realistic, but at the same time, think big. You know what I'm saying? Like a lot of you are saying the comments section or somewhere, you know who you are, saying that I can turn 1K into 10K. You don't even have 5K, I'm like, you need money to make money, okay? But what I'm saying is that it all comes down to, don't pursue this to get rich quick. - I think the same thing goes to like the action you take. Like some people, they're gonna back this, like they start. They're going at this like ten times in a week. But then after the week they're like burnt out, they do nothing, and they sell it. So you gotta be kind of consistent in your work. Like you work, you take some time off perhaps and work more until you get to your result, right? - You get burnt out, like what Etienne said. You put in the hard work, put in the patience. - You need to just be disciplined to work hard and also watch your account grow, like it's hard. It's hard to wait, it's hard to work hard. That's why most people don't do it. That's why most people come here to get rich quick, which I don't believe in that. Even though that people will sell you that kind of lifestyle, but I don't believe in that, okay. Then the second tip. But if I am to sum up everything. Start finding your holy grail. - Yeah, it's big. It's challenging to find the perfect thing all the time, that kills a lot of people. Because I feel like people like follow us in the past, and you probably see the same thing, is that they wanna make everything perfect. Like find the perfect strategy, find the perfect thing, and when it's not perfect, they quit. - Yeah, like if you develop your system and then you find that it's not profitable, then you retest that precedent, or you add one new strategy. Sometimes the reason why your system doesn't work is probably because you just stick to widening the target price a little bit, or maybe tighten your stock bonds a little bit. Maybe its just that one small adjustment you need to make, then your system will go from not being profitable, to profitable. Now here's the thing, when it comes to finding a holy grail, nobody has the holy grail, nobody, like nobody. Even Paul Tudor Jones, you know Paul Tudor Jones right? - In 2008, while other people are dying, Paul Tudor Jones made 30%, 30% positive OI. So a lot of people think that, well probably, that Paul Tudor Jones has a very high win rate, 90% win rate, maybe he has the best system in the world. Now here's the thing, Paul Tudor Jones, the last time I read about him, he only has a win rate of 45%. - Not no more than half, so how does he make money in the long run? By having a good history. Do you see him waiting around searching for the holy grail, attending get rich quick courses, after get rich quick courses? Like he just take what he has, even though its not perfect, you just use that and make the most of it, that's it. You don't go and find the perfect system that has 100% win rates. Now my system is not 100% win rates, just two days ago I had two losing trades, and yesterday I had two winning trades. Now here's the thing, even though I get at least two loses every week, some of mature of my wins cover my loses, then in the long run you can make money, even with 40% win rate, 30% win rate, so stop pursuing the holy grail. - So like you said before, I think it's about understanding like there's a time where you have to learn, alright, there's a time where you have to, maybe you're struggling a little bit, putting into practice what you learn, and then going to back to what you learned and what you've practiced yourself. As opposed to trying something new every time, and searching for new strategies everyday, that's big. What's your third and last tip? I wanna hear it, it's going to be awesome I know. - Last tip, the secret of very successful traders that I talk to all around the world, I talk to in Singapore is they all have one thing in common, is that they are very good in risk management. Risk management. If you listen to Paul Tudor Jones, back to him again. Like he says the most important factor to my success is risk control. Like you would expect something like, oh the most important factor to my success is because I use this indicator that you don't have. - Finding the right setup, yeah. - Like I have the best setup in the world that you don't have, that's why I make money and you lose money, you know what I'm saying. It all comes down to how you manage your loses when you lose. Now heres the thing, one person said this one quote, I don't know if you've heard of this; its not how much you make that matters, but how much you lose. Is that right? - Something like that, something like that. - It's like its not about the upside, it's about the downside. - It's not about upside, it's about downside, something like that yeah, just go and search for it. Basically it's not about how many times you win out of ten times that you trade, it's about how much you make when you win, yeah that's right. How much you make when you win, how much you lose when you lose that matters. Winning minimizes your losses, maximizes you winnings. Winning has a history that we show. Now the first thing, I'm sure you know this, but the first thing professional traders and retail traders... Professional traders they focus on history that we show. Retail traders they're always thinking about out of 10 trades, how many trades can I win? - Yeah, being right, it's like wanting to be right. - Wanting to be right all the time. That's why people stop using stock loss, they don't use stock loss, they adjust stock loss so that they can win 99 trades out of 100 trades. But it only takes that one stupid trade, that one stupid trade to blow up everything. Like you can have a 99% win rate and still lose money in the long run. - So focus, focus on your risk management and once you have a good system in place, you have a good psychology in place, you wouldn't go wrong, you wouldn't go wrong in the long run. You'd make money in the long run, you'd be consistent in the long run. So it's not about being the perfect trader, it's about being a good risk manager. That's it. - If you guys wanna see more check out Karen's channel, we'll have a video with me answering some questions and giving some tips. We'll link that video if you want to check it out, it should be published by now. If you have any questions type them below, comment below with those questions, we'll make sure to answer you. Here are some of the comments from the past video. I appreciate it if you guys send me comments, as always below the video. And with that note we'll catch you back here tomorrow. Chiao. Having overcome numerous setbacks in her life, she has gone on to inspire thousands of youths working executives and leaders of various companies to REALIZE THEIR ABSOLUTE WILDEST DREAMS through her INTERACTIVE, INSPIRING AND ENGAGING TALKS. Being labeled as the “quietest student and underachiever” throughout her life, she went on to win numerous awards in public speaking contests, scholarships and hosting large-scale events as an emcee. She was then featured in various print media for her academic achievements. She has also been invited to speak at an international conference to leaders from Brunei, China, Hong Kong, Laos, Malaysia, Vietnam, Indonesia, Myanmar, and Singapore. Karen has been ranked #1 in a Singapore nationwide Forex trading competition, competing with over 200 traders from NUS, NTU, SIM, and SMU. She was also ranked 10th in a contest organized by FX Street, competing with over 3000 traders from over 20 countries. She has shared the stage with top investment gurus and CEOs at an international expo held at Marina Bay Sands. She is also the contest judge for numerous public speaking contests held around Singapore, ranging from club level to the National level contests. How To Find Karen Foo?